Gatorade is a sweet tasting vitamin enriched sports drink made for rehydrating sports men. It replaces electrolytes used during exercise and is appropriate for both athletic and non-athletic persons. However, it should not be consumed in large amounts because it can cause serious medical side effects. This is the most common effect of excessive consumption of Gatorade. Calorie King points out that every serving of 32 oz. of Gatorade contains 200 calories. This will be stored up as excess fats leading to weight gain. Therefore drinking more than enough Gatorade is likely to lead to increased weight. Too much Gatorade can also lead to vitamin toxicity or hypervitaminosis A. This is because the product has enhanced vitamins and minerals like vitamin A and fat soluble vitamins which should not be consumed in excesses. According to the National Institute of Health, consuming vitamins too much is characterized by fatigue, blurred vision, headache and nausea. From the ‘Runners World’ perspective, hyponatremia is a fatal side effect caused by overdrinking in athletic sports. This is the over hydration of cells causing very low sodium levels in the body. This is deadly, and athletes should note that too much Gatorade intake in sports is risky. This is contrary to popular belief because often people believe that drinking too much Gatorade is beneficial. Excessive consumption of Gatorade consumed when eating salty foods can lead to high blood pressure. The Center for Disease Control and Prevention acknowledges that too much salt intake is a likely cause health risks like stroke and heart attacks. Calorie King notes that a bottle of Gatorade has 800mg of sodium which is the required daily amount of 33% salt intake. Exceeding this is dangerous. The Calorie King website states that in every bottle of Gatorade, there are 56 g of sugar. Although it is advisable to replace lost sugars after exercise, too much intake stimulates high blood sugars. Everyone has different sugar needs, but excess intake can be dangerous for diabetics and those suffering from other conditions. Sodium. Potassium chloride or salt is an ingredient in Gatorade. It is used to improve the taste by regulating the body’s fluid balance. Sucralose. Sucralose tastes like sugar and is as an alternative to sugar. It is distributed or sold as splenda. It sweetens foods and beverages adding fewer calories or carbohydrate. Unlike sugar, sucralose is not easily broken down into calories required for energy supplies. Weight management programs featuring physical and nutritional checks find it the appropriate sugar. The sucrose consumed in the body does not remain in the body. This is because it is partly absorbed into the system and most of it is excreted through urine. Citric Acid. The natural acid from citrus fruits like limes and lemons is used as a natural preservative. It has a tart flavor that compliments the sweet sticky taste in Gatorade. On their website, it is stated that this flavor leaves your mouth feeling clean. Unfortunately, it may be harmful to your teeth. Filtered Water. This is purified water cleaned through filtration. The filtering process ensures that the water is at the right pH by removing impurities selectively and retaining the important minerals which the body needs. Natural Flavors. Products that do not contain fruit juice and spices will have natural flavors. This is an artificial taste that is added to improve the taste of your drink. Sodium Citrate. Sodium Citrate is used as a food additive to enhance flavors and as an additive. In Gatorade, it maintains the stability of active ingredients. Like calcium citrate, sodium citrate has a citric acid and salty taste. It is like other sour salts featuring the sodium and calcium citrates. Sucrose Syrup. Sucrose syrup is made from liquefied table sugar or sweeteners. It is high in empty calories, low in nutritional value and likely to cause tooth decay. The Mayo Clinic cautions that when taken regularly it is likely to cause obesity which contributes to type 2 diabetes, high blood pressure and coronary artery diseases. Drinking 20 oz. of sucrose is an equivalent of 8 tsp. of sugar. An 8 oz. of Gatorade has 14 g of sugar which is equal to 3.3 tsp. Artificial Colors. Artificial colors come in different shades tagged with numbers. These are used as an ingredient in the soft drinks. 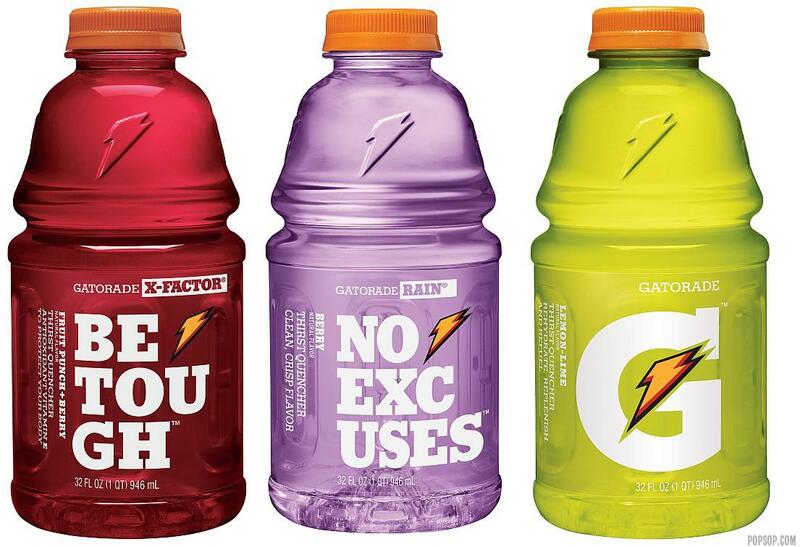 Gatorade.com states that colors in its drink only symbolize different flavors. The FDA notes that these are safe for human consumption because the least amount of dye is used in the coloring process. Brominated Vegetable Oil. Brominated vegetable oil is obtained from soybean and is used as an addition to vegetables containing citrus oils. Its BMV content hinders the rise of the oils to the surface and stabilizes the flavor mixture. High Fructose Corn Syrup. Made up of two to three carbohydrates, high fructose corn syrup is the source of glucose, sucrose and fructose found in sports drinks. It is scientifically made in the right proportions for a tasty drink that has the right fluid absorption, and energy delivery. Although used as a preservative in processed food, it should be avoided. Monopotassium Phosphate. Monopotassium phosphate is approved by the FDA as safe for the heart. It is often added as a phosphate. Glycerol Ester of Wood Rosin. Harvested from pine stumps, Glycerol ester of wood rosin has been declared safe for human consumption by the National Institute of Public Health. Purified to the beverage gum grade, it is used to float oils in products containing citric acids oils.